It was slim pickings for the Cryptos in the financial markets as the grind lower continued. With interest now diverted towards other digital assets like the tokenized securities, stable coins & cross border digital currencies, any meaningful recovery looks increasingly elusive any time soon. The American stocks, on the other hand, bounced right back with the V-shape recovery that we cited last week extending further, despite more depressing economic news from around the World. On the Forex front, risk currencies have been reinvigorated with the rebound in U.S stocks – Greenback is on the retreat. Here are the numbers for the week before we jump into the details. Bitcoin made a fresh low on the week this week with some bullish but choppy consolidation being seen right now. As usual, there were some good news & some bad news from the Cryptoverse. On the constructive side, the VanEck, CBOE, and SolidX collective application for Bitcoin ETF which was pulled voluntarily on Jan. 22 due to the ongoing U.S government closure at the time, has been refiled, but don’t expect any decision on the matter anytime soon. At least the ETF is back in play. The second was the pre-release of the Ethereum network’s eventual transition to ETH 2.0 (Serenity) sometimes later in February. Project Serenity will see the shift of the network from the PoW to PoS consensus algorithm as the popular network gears towards tackling the issues of scalability, economic finality and security. On a side note, the Jamaica Stock Exchange announced the listing security tokens soon. Scammers & hackers launching massive attacks has indeed become the biggest headache for the digital networks as we saw in the case of the New Zealand exchange Cryptopia which was hacked a few weeks ago. The exchange suspended its operations after the hack, but according to blockchain infrastructure firm Elementus, it is still compromised by the hackers. Also in the news was the P2P crypto platform LocalBitcoins, when it revealed that it was breached by unknown malicious actors but apparently the logins are now safe. Just goes to show how big of a problem hacking has become for the digital exchanges. The figure above shows the 200 most profitable Ethereum scans for the past two years. Looking at the BTC chart, clarifies how the selling pressure is gotten a firm grip on the crypto kingpin & all the Alt.coins for that matter, since they move pretty much in tandem with Bitcoin. The week saw a new low from BTC in the region of $3420 from where it has been consolidating & making higher lows. The downward momentum is intact as long the immediate resistance around $3580 holds – a break of this level would extend the consolidation, but only a break of $3680 would flip the bias back to the bullish side. The total market cap stands @ $115 billion with the BTC dominance @ 53.4% at the time of writing. The U.S stocks rally went into overdrive with a bunch of positive news. FOMC’s U-turn on the rate sentiment, strong January Jobs report, U.S-China trade talk moving towards resolution all provided the boost for the U.S markets. Despite a plethora of weak data from Europe & China confirming the global economic slowdown, markets continued to price in the good news rather than the bad ones. Downbeat manufacturing data from China (PMI 49.5), plummeting retail sales in Germany (-4.3%) with Italy officially entering a recession (0.2% contraction in Q4) were all ignored – need I mention Brexit. In my opinion, the investors are banking their hopes a little too much on the trade tariffs resolution between the two biggest economies to bring a global relief & ignoring the cyclical economic factors. For the week, all the three major U.S indices closed comfortably in the green as the bullish rally from the pre-Christmas slump maintained its bullish momentum. The benchmark S&P 500 has been moving in a bullish channel with the support around 2620 looking to provide rebounds on a correction. Only a convincing break of this level would flip the bias to the downside. For now though, it looks as the index has carved out a temporary low. Forex markets saw a resurgence in risk appetite as rebound in Equities sparked a sell-off in Greenback. Commodity pairs were the biggest beneficiaries, while EURUSD & GBPUSD improved on their ST outlook as well. The Brexit drama has kept the volatility in GBPUSD high, as the pair is comfortably above the 1.3000 psychological barrier. Analyzing the Dollar Index chart, it is evident that any dollar gains are being capped. A broader consolidation band has been established between 95.00-96.60, with the breach of either of these levels defining MT trend. For now, it looks as have entered a phase a broad-based consolidation. Next week sees the employment numbers from Canada, Australia & New Zealand, BoE rate decision & inflation data from England & US ISM services data. 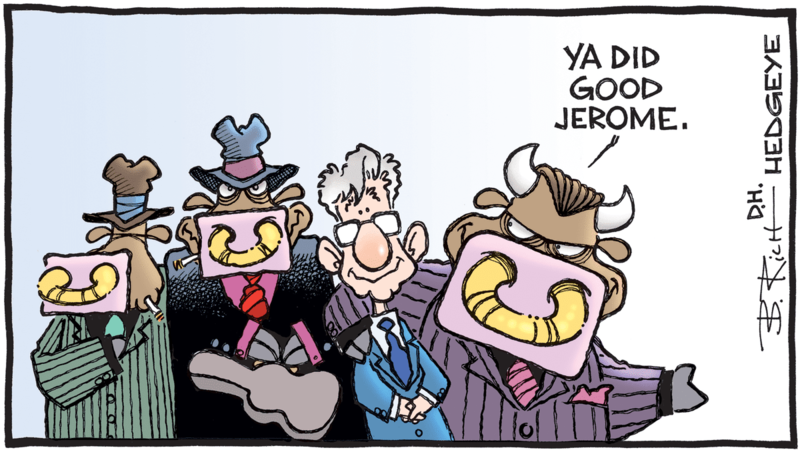 Signing off with this comic portraying the happiness FOMC Chair Jerome Powell has spread in the markets with the recent change of hearts towards any further rate rises.